I have finished the construction on my first Remains of the Day journal that I am making with about a gazillion wonderful and creative people in Mary Ann Moss' latest online class. Hurray Mary Ann!!!! She is a hoot and I have enjoyed every class I've taken with her so far. Here is a video showing the constructed (but as yet unfilled) journal. Enjoy! 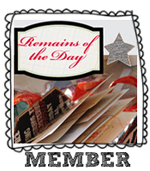 Remains of the Day Journal #1 from Cindy Harwood on Vimeo.